No matter how you prepare them, Maine lobsters are a gourmet treat any time of year. 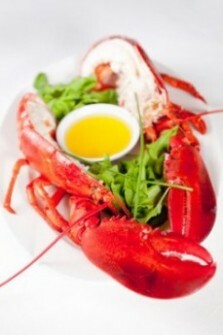 But at Christmas, lobster is often celebrated as the Christmas Eve dinner main course. For some hungry family members, the bigger the Christmas lobster is, the better. A few jumbo lobster recipe cooking tips may help. In just a few days Christmas Eve chefs all across the country will boil, steam, bake or grill Maine lobster. But cooking those jumbo lobster to satisfy family members can be tricky. Care must be taken not to overcook, or the meat will toughen. Under-cook a jumbo lobster and the lobster will not have its succulent flavor. Given this challenge, even experienced cooks may be surprised to learn that that the lobster antennae can play a role in helping chefs determine when a whole lobster is cooked and ready to take out of the steam pot. Steve, a former Downeast Maine lobster fisherman who now lives in North Port, Florida, recently shared with Lobsters-Online an experience he had with jumbo lobster. He says timing how long a big lobster cooks is not always accurate as those on the bottom may cook faster than those on the top. To double check if a lobster is done, Steve firmly stands by the practice of giving a pull on the lobster antenna. If the antennae pops off easily, the lobster is done. If it stays on, the lobster needs to cook a little longer. Steve said once for his birthday at a restaurant he ordered a giant 13-pound lobster for himself and a 10-pound lobster for his sister. Steve said he then broke the 10-pound lobster open and showed everyone that the meat was not fully cooked. The manager apologized and took them back to cook some more. The Jumbo lobsters were delicious, he said. “Cooking lobsters according to time tables does not work all the time and they can be raw or become over cooked,” he said, adding that it is also important to move the lobsters around in the pot to make sure they cook more evenly. Get ready for Grilled Baked Stuffed Lobster and the best lobster dinner you’ve ever had. Start out with a pair of fresh four-pound live Maine lobsters, a hot charcoal grill and get ready to prepare a lobster feast you will never forget. This recipe is best with cold water lobster, which means lobster from Maine. If you can’t buy jumbo lobster near your home, you can have Maine lobster delivered right to your door anywhere in the country from a lobster online service. This recipe is easy to prepare and takes less than an hour. The result will be the best baked stuffed lobster you have ever had. Get ready for the best baked stuffed lobster you have ever had. Every New Year holiday there is heard the same debate about what size lobster to order for the New Year’s Eve dinner celebration. Do bigger lobster have more meat? Are bigger lobster tough when cooked? Are jumbo lobster priced better? There are differing opinions on the quality of taste between a smaller lobster and a jumbo lobster, but these opinions are based on legend and not fact. Cooked properly, a six-pound lobster will be just as delicious as a 1-1/2 pound lobster. However, care must be taken not to overcook a large lobster. Overcooked lobster meat will toughen quickly. Steaming is the most forgiving way to cook a jumbo lobster. So follow cooking instructions and tips carefully and your jumbo lobster will be just as succulent as a smaller lobster. Among the most important factors affecting taste is freshness. Ocean fresh is best. For example, supermarket lobster that sit in tanks for weeks at a time will begin to lose weight as the claw meat shrinks. When cooked, the supermarket lobster won’t taste as succulent as an ocean fresh lobster. The next important factor is to make sure the lobster is flavorful is to order what is called the “hard shell lobster.” Lobsters “molt,” which means they shed their shell as they grow. After molting, the lobster’s new shell is soft. During this growth period, lobsters are in a weakened condition and do not travel well. Soft-shell lobster also have less meat for their size and some people are of the opinion soft shells are not necessarily as flavorful as the hard shells. The connoisseur won’t take a chance and will usually avoid soft-shell lobster. So the keys to succulent jumbo lobster is careful cooking, freshness and selecting hard shells, but are jumbo lobster also a good value? Larger lobster have a higher volume-to-surface ratio, yielding a little more meat per pound. Not a big difference, but there is a difference. On a practical level, jumbo lobster have larger legs, swimmerets, body and shoulders. The meat in these parts of the lobster is considered a delicacy. The truth is, on a large lobster the meat in those places is much easier to get at then on a smaller lobster. The legs especially will have a higher volume of meat. The larger claws on jumbos will also offer up to 20% more of the very desirable sweet claw meat. The Maine lobster lives in the ocean and is still harvested much as they were in the 19th century. Lobster fishermen go out in season to collect lobster from their traps and the lobster is delivered to market daily. Since the harvest varies from month to month, lobster prices go up and down with supply and demand. Waterfront Maine lobster pounds such as the ones operated by the Lobster Trap Company allow the storage of ocean fresh lobster, helping to stabilize prices in the off season. Jumbos begin at 2 ½ to three pounds with the weight measured wet, or right out of the tank. Some years the price-per-pound for jumbos is higher than quarters, halves and selects. Some years the price per pound is less. It just depends on the supply and the demand. Lobsters-Online.Com ships only hand selected, fresh lobster. The hard-shell lobster are lively, healthy, and ocean fresh. 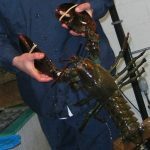 By operating water-front lobster pounds in Maine, Lobsters-Online.Com is able to offer customers ocean-fresh jumbo lobster year round. So go ahead an order some jumbo lobster for your New Year’s Eve dinner celebration. And have a Happy New Year!